TOKYO, Japan, April 8, 2011 (ENS) – Four people have died and more than 100 were injured in the 7.1 magnitude earthquake that rocked the northeast coast of Japan’s Honshu island on Thursday, the second quake stronger than 7.0 to hit the area in less than a month. Many buildings were damaged and over 3.6 million households are without electric power. Thursday’s quake did not change the status of the Fukushima Daiichi nuclear power plant, crippled in the March 11 earthquake, but it caused a power supply interruption to a different nuclear plant and a uranium enrichment facility. Power was lost on two of three lines supplying off-site power to the Onagawa nuclear power site on the Pacific Ocean about 120 kilometers (75 miles) north of the Fukushima Daiichi plant. Water leaked out of spent fuel pools at Onagawa but there was no change in the radiation levels outside the plant, operator Tohoku Electric Power Co said on Friday. “Cooling of the spent fuel pool was temporarily lost, but has subsequently been restored,” reported the International Atomic Energy Agency, adding that no change was observed in the readings from the on-site radiation monitoring post. During Thursday’s earthquake, water sloshed out of spent fuel pools at three of the Onagawa plant’s reactors, which have been in cold shutdown mode since the 9.0 magnitude quake on March 11. The most water spilled was 3.8 liters, Tohoku reported. Radioactive water also leaked in three other locations in Onagawa’s Unit 3 reactor complex. The March 11 earthquake damaged the turbines in the Unit 3 reactor at Onagawa after a fire broke out. On March 13, Tohoku Electric declared a brief emergency at the site when radiation levels spiked, but within hours the IAEA announced that radiation levels had returned to normal background levels. One of the crippled external power supplies at Onagawa was restored on Friday morning, Tohoku said. The Japan nuclear safety agency confirmed that the earthquake Thursday caused Rokkasho reprocessing plant and uranium enrichment facility in Aomori Prefecture to lose off-site power, but emergency power supply kicked in and the facilities currently are operating on emergency diesel generators. The situation at the Fukushima Daiichi nuclear power plant remains “very serious,” according to the IAEA. The plant suffered major damage from the earthquake and tsunami that struck the country on 11 March and has been spewing radioactive contamination into the environment ever since. 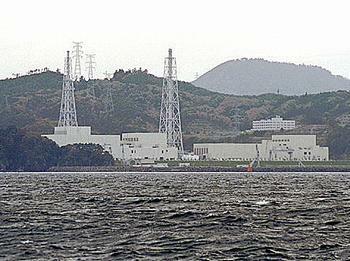 Fukushima Daiichi operator Tokyo Electric Power says radiation levels continue to rise in seawater north of the plant. TEPCO said seawater collected on Thursday 30 meters from plant outlets tested at 110 becquerels of radioactive iodine-131 per cubic centimeter. That level is 2,800 times higher than the maximum allowed under government standards. Samples taken at the same place tested lower on Tuesday and Wedneday.